Hi ladies-not a jeans post, but getting the denim out for summer in the form of jackets, skirts, shoes, bags, playsuits-anything but jeans!! Christopher kane-so many people love these!! What's your favourite non jean denim item for summer, that you have or want to own? I like those booties in the first picture. Oooo I really would love a denim playsuit. At the moment I make due with a denim mini by Hudson. Love the jacket! Hi Wendy-yes, a great style alternative to leather! Hi asian cajuns-thanks so much!! A denim mini is spot on for summer!! I used to live in denim in my 20's... now I don't own any!! and i would really like a denim vest for this summer. I love your site and style!! Keep it up!! Hi ladies who Lunch-I suppose its the phases we all go through-I'm still loving my denim one!! Hi cate- I actually got these images online from Harpers-check my favourites and click on Harpers bazaar to get there-it is a few weeks old now. Yes, I got a vest (waistcoat) too, a Levis one!! Hi the world is my catwalk-thanks for stopping by my blog and for the lovely comment!! Yes a denim maxi is effortlessly chic and never goes out of style-good choice! I've cut down my Gap denim skirt to the perfect short length but not a mini. I'm slowly but surely fraying it and so far I've worn it loads! Does require self tan for legs to get away with it. Cool. Never seen boots like that in deninum. Got have a little denium through out the year. Hi owner of this space!! Maybe you could try Ebay!! Thanks so much for your comment! Hi kate-yes, this is a great idea-I have an oasis denim mini (for house and beach!) 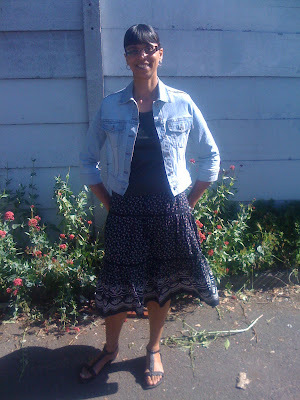 and my longer faded Diesel denim skirt is for anywhere!! Hi ellie-yes denim is a must all year round really and the boots are unusual, aren't they!! I love denim shorts in summer - so perfect and comfortable. i haven't been wearing denim-blue jeans for more than a year but i agree that other denim items are absolutely delectable. i found an old denim vest lying around the house the other day which i'm going to wear soon ..
apart from that, it's the denim jacket that i love. esp in a dark denim wash. i think they are brilliant. p.s. the denim boots are to-die-for. now, i'd love yet another pair of boots! i cant believe all the denim on denim! Love denim, and I was going to do a post on it this week!! Haha, great minds think alike. They are having a sale at shopbob at sooo many great styles, going insane. Love the boots! I love my denim jacket (I did a post on it a while ago), I recover it from 4 season ago.. still looks like new, and this summer denim jacket (as yours) is a must. LOVE the collages and that jean jacket is very flattering on you. Hey Sharon, I'm really loving all the light wash denim I've been seeing lately. So fresh for summer! Oh and those denim shoe boots are crazy hot! Denim! Denim!! The denim jacket is lovely! Nice jacket! I have this denim belt that my little sister used to have tha I really like. Hi Nadine-yes a great item to have in the wardrobe!! Hi p-I agree, denim is soo versatile and BTW, the denim boots are by Christopher Kane-they rock!! Hi bear-yes, denim is hot!! Hi Silje-I would love to see your post on denim too! The boots are by Christopher Kane! Hi atelier-great minds think alike-I love my denim jacket too!! Hi something picasso-thanks and would love to see this levi's jacket on!! Hi danz-yes i'm sure faded denim is just in for summer, but I love it anyway!! The boots are by Christopher Kane. Hi secretista-thanks so much-yes, denim is fabulous!! Hi angeline-thanks so much for stopping by my blog-the vest is a good start!! Hi cupcakes and cashmere-i agree that faded denim maybe in just for summer, but trends always come back again, so it's worth storing any stuff for when the trend resurfaces!! Hi on track-thanks and yes, these sandals are very comfy and very versatile-ha ha!! Denim really rocks and your outfit is great! I really want a pair of denim cut offs & romper!!! & those denim boots are amazing. The denim Mulberry bag is sooo cool! ps: If I didn't have twin dresses I couldn't bare to sell.. I usually don't wear jeans in summer cause it's too hot, but this year I'm still wearing sweater so... I should give a try to skinny denim jackets and feminine dresses combo. yeah ive been so sad that i sold my jean jacket last year, i may have to go buy anothe one! Hi angelgrotton-thanks so much and I agree, I love denim too! Hi yiqin-great choices for summer-love to see them when you get them!! 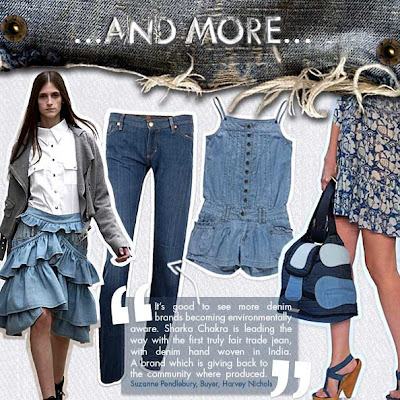 Hi times of glory-thanks for your lovely comment- I so agree, denim rocks!! Hi marte-thanks so much!! yes the bag is divine! Hi madamedior-thanks so much for stopping by my blog!! A denim dress is great for summer!! Yes, your store is really looking fabulous!! I love denim skirts, guess I don't have a vest but that might be nice! Hi alicepleasance-yes I think its a good combo for summer!! Hi emma-a denim jacket is always a good investment!! Hi pamcasso-a vest (we call them waistcoats!) are ace for summer!! So pleased to hear that-look forward to catching up with your news of the day-ha ha!! Ahh good old denim! I'd love a denim playsuit! I love the romper in the second photo. Any information as to where I can purchase it? Hi all of the above-thanks and it did take me forever (and a few thrifted and given away jackets) to get the right one-hope you find one soon!! My favorite non-jeans denim piece would have to be a cute denim romper (too bad I don't own one yet). Next to that, a good jacket like the one you have on. Hi wendy-hope you find both of these-lovely choices for summer!! ahh the romper is gorgeous!! yess i am really lucky to get the entire bedroom as my closet...we'll see how it turns out though! Hi fashion is poison! Yes, I'm pleased for you-this will be excellent when its done! !